NAMASTE, ROWAN: Will this matter a year from now? When we go through a stressful event or time, it can become all that occupies our thoughts, and it can feel as though there is nothing else outside of it. It becomes all we focus our energy on, and we feel like it's always there at the backs of our minds, burrowing away and making itself a cosy little nest with no intention of leaving. But, thankfully, more often than not we move on. Be that in a matter of minutes, hours, days, weeks, even months. The point is that we move forward, and life goes on. 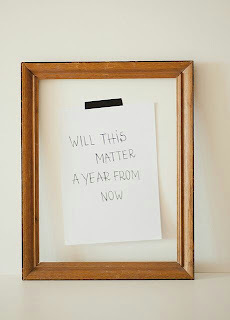 When we go through difficult times, sometimes it helps to ask ourselves 'will this matter a year from now?'. Although your instinct in the heat of the moment might be to say yes, if you actually take a step back, detach yourself from the situation and really think about it, you may find that the answer is actually no. Of course, some things will still matter in a year's time, but in that situation chances are you're dealing with something bigger, and a different approach needs to be taken. But when the answer is no, and you know that it won't matter in a year, suddenly things seem somewhat easier to handle. Knowing that in a year's time you'll have moved on from what is happening, perhaps even forgotten about it, makes the it seem much smaller, much easier to handle, and you see that you probably don't need to worry so much. Of course, times can still be tough, and knowing that in a year it won't matter doesn't change the fact that it still matters now, but it does ease the strain slightly. When caught up in the midst of a difficult situation, we often picture the worst case scenario, and we imagine our current problems impacting on our future far more than they actually will, but by taking a step back, putting our emotions to one side for a moment and looking at the bigger picture, we can see more clearly what the impact of our current situation is actually likely to be. You can ask yourself this question in many situations, however big or small. It takes strength to pull yourself out of the storm of emotions you feel during trying times, but if you can do it for just five minutes - perhaps sit in a quiet room, by yourself, with as few distractions as possible - you can make a great impact on how you feel and the way you perceive the situation. Just picture yourself in twelve months' time, think of the difficulty you're facing, and think about how likely it is that you'll still be in that situation then. A lot can change in a matter of days, let alone months (and twelve of them at that). In twelve months, you could be a very different person to the person you are right now. You could be in an entirely different place. You could have a new job, new friends, new opportunities and a wealth of new experiences behind you by then. Our lives are constantly growing and changing, and although that can be scary at times, it also means that there is plenty of scope for us to recover from and move on from challenging times. 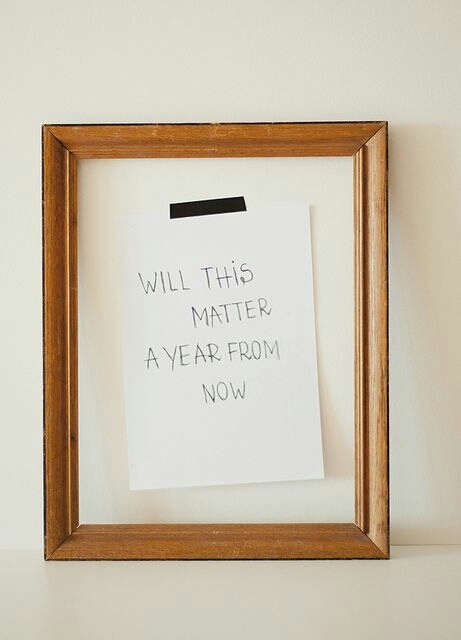 So when you're faced with what feels like an overwhelming situation and you feel like there's no way out of it, just ask yourself, will this matter a year from now?